Christopher Knowles is a multidisciplinary artist whose work has had a visible influence on American postmodern performance, poetry, and visual art since the 1970s. The Sundance Kid is Beautiful presents Knowles’s work in a staged performance environment that incorporates many of his diverse approaches, including dance, acting, sculpture, music, text, and visual artwork from various periods of his long career. During the sixty-minute solo work, Knowles creates moments of dramatic stillness and motion in different scale registers that explore specific aspects of his unique world. 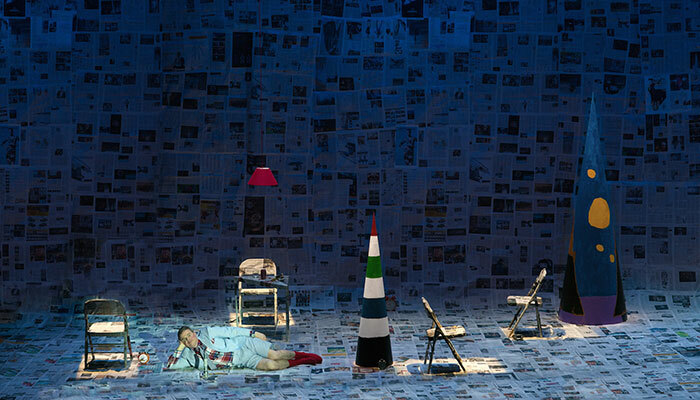 A newspaper landscape containing Knowles’s alarm clock collection, recent sculptures, and a finely tuned lighting and sound environment evokes themes surrounding the measurement of time, communication, sign systems, and popular culture. Despite his work’s far-reaching impact, the critical scholarship that currently addresses Knowles focuses on either his influential early collaborations with the artist Robert Wilson, or takes his autism as a lens through which to consider his artistic practice. 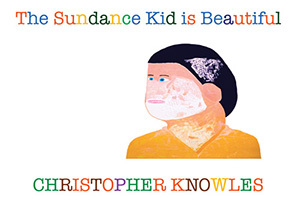 The Sundance Kid is Beautiful with Christopher Knowles aims to present Knowles as a multidisciplinary solo artist whose neurological difference expands, rather than determines, the reading of his work. During the production’s residency at the University of Rochester, Christopher Knowles and the project team will develop the work’s lighting, sound, costume design, and staging in preparation for a final open rehearsal on the last day of the residency. Advanced undergraduate lighting and sound students will work directly with the production’s lighting and sound designers as both co-designers and technicians to help realize the work, and other students will be involved as production runners, costume, and staging assistants throughout the week. The open rehearsal will present an opportunity for members of many communities across the humanities at the University of Rochester to engage with Knowles’s multidisciplinary practice, to be exposed to how performance can function as an artistic model for bringing diverse media together, and to encounter a method of collaboration that supports the neurological diversity of its participants. The rehearsal will be followed by a talk back with Christopher Knowles and the project’s primary collaborators, moderated by Nigel Maister. Major support for this residency has been provided by The Humanities Project and the University of Rochester School of Arts and Sciences. Additional funding has been provided by the Program in Visual and Cultural Studies and the Program in Film and Media Studies at the University of Rochester, with support from the University of Rochester International Theatre Program. This performance is also supported by The Institute of Contemporary Art at the University of Pennsylvania, The Watermill Center, Gavin Brown’s enterprise, Dissident Industries, American Friends of the Louvre, and the Martin E. Segal Theatre Center at The Graduate Center, CUNY.